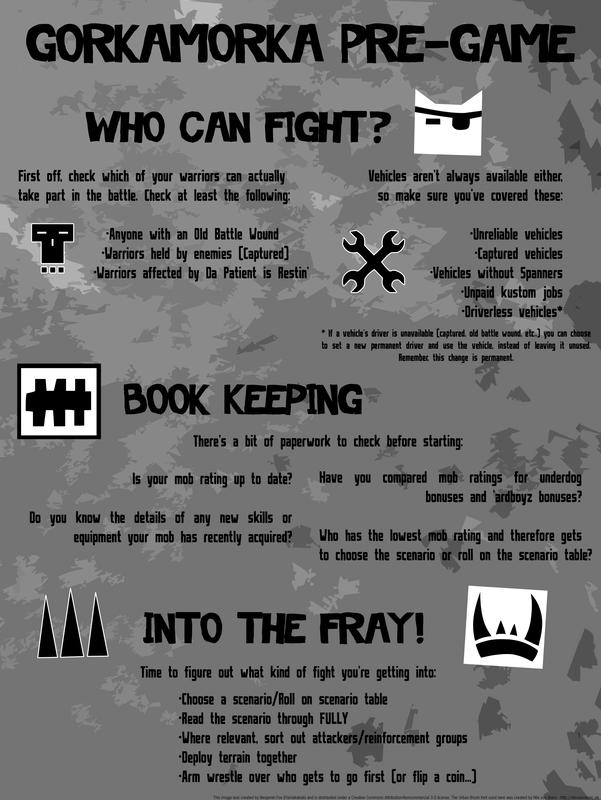 Hey folks, Flamekebab speaking, here’s a little something I’ve put together – a pre-game reminder sheet. I don’t know about you, but when I want to play a game of GoMo there’s always something that I forget to take into account. With any luck this will put an end to that and generally speed things up, which leaves more time for actual gaming! The image dimensions may seem a little awkward as it is neither A4 nor US Letter, but actually this is intentional – it should fit on both without needing to be cropped or resized. I hope it’s not too ugly as it’s my first attempt at something of this nature. I intend on making a post-game one as well though, so with any luck my skills will improve and your eyes will bleed less! 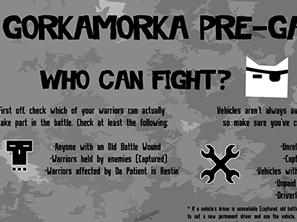 The Gorkamorka Pre-Game chart was created by Benjamin Fox (Flamekebab) and is licensed under a Creative Commons Attribution-Non-Commercial-Share-Alike license. The Urban Brush font used in the chart was created by Nils von Blanc. This entry was posted on Sunday, August 1st, 2010 at 20:58	and is filed under Ere Be Stuff, General. You can follow any responses to this entry through the RSS 2.0 feed. You can leave a response, or trackback from your own site.